A 19-year-old man from Virginia who wanted a private meeting with Republican presidential candidate Donald Trump climbed his namesake building for nearly three hours before police officers finally grabbed him and hauled him inside Wednesday, officials said. The man, identified as Stephen Rogata, began climbing Trump Tower, where the billionaire businessman lives and works, at about 3:30 p.m. from an outside atrium attached to the building on East 56th Street, NYPD officials said at a news briefing Wednesday evening. Hundreds of onlookers watched from the street with bated breath as the man used climbing ropes and several construction-grade suction cups to make his way up the side of the 58-floor building, evading officers the whole way. Watch the dramatic moment when NYPD officers finally grab and bring in the man who climbed Trump Tower for hours Wednesday evening, eluding cops the whole way. Read more here. Who Is the Trump Tower Climber? 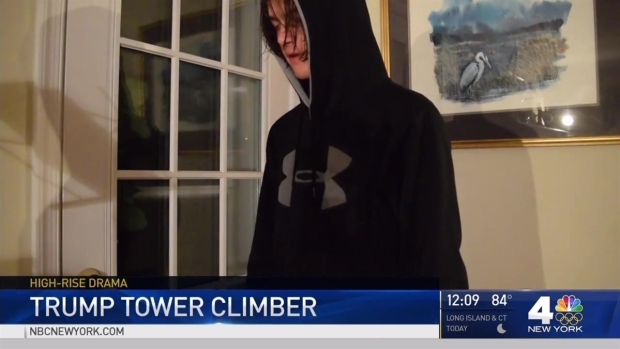 The Trump Tower climber is apparently a troubled teen from Virginia. Jonathan Dienst reports. NYPD Chief of Detectives William Aubry said Rogata is a researcher from Virginia who arrived in New York City Tuesday intent on meeting with Trump. He had no intention of hurting anyone, he told police. Rogata had suction cups and climbing equipment in his backpack and several IDs, along with some Gatorade, according to officials. He was charged Thursday with reckless endangerment and criminal trespass. It wasn't immediately clear if he had an attorney. A naked man yelling, "Donald Trump, where are you? ", climbed to the top of the red TKTS stairs in Times Square Thursday morning, then fell to the ground in an attempt to escape police, photos and video posted to social media showed. Marc Santia reports.